A while back, Wisconsin Cheese reached out to me to develop a recipe for the Harvest edition of their online magazine. They wanted to include an easy, seasonal lunch recipe. You can find the recipe here, if you don’t feel like scrolling to the bottom of this post. I’ve also posted the nutritional information at the bottom, since the magazine doesn’t list it. I know what you’re thinking, “Oh, what’s the difference? I might as well chop these veggies up and add them to my salad.” But I’m telling you, vegetables and fruits in noodle forms changes the taste and intensity. Plus, there’s more veggie in every bite – the chopped ones always fall to the bottom of the plate or bowl and you’re left with the “good stuff,” after eating uneventful forkfuls of spinach. With noodles, they intertwine with the lettuce and fluff up the salad. Plus, veggies are fibrous and help fill you up! Pears are a wonderful way to add sweet flavor to a salad – they’re velvety, smooth and I think, totally underrated. I’ve been snacking on them nonstop since they started carrying them at my farmer’s market! If you’d like to check out other ways to use spiralized veggies in salads, check out my Pinterest board or click here to see them all on the blog. 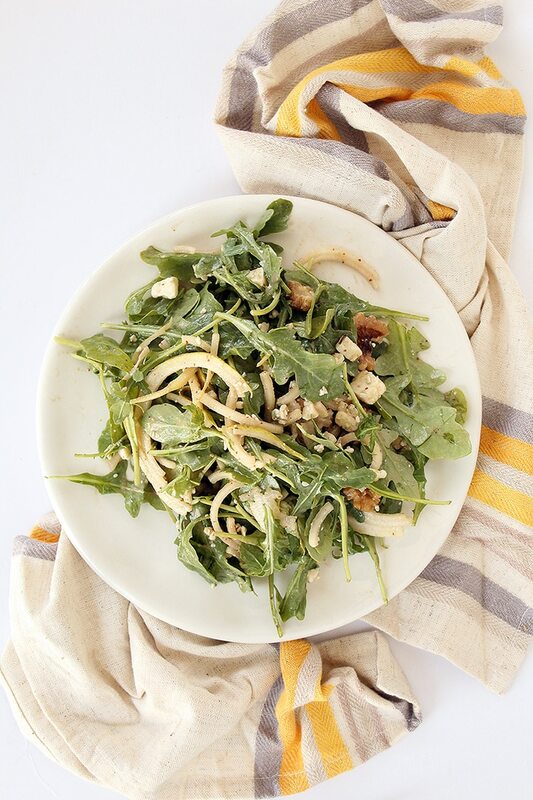 Check out this simple arugula-pear salad by clicking here. The blue cheese is the kicker.. I mean, you just can’t go wrong with blue cheese and pears. What are your favorite ways to spruce up salads? Place ingredients for Greek yogurt balsamic dressing into bowl and whisk together to combine thoroughly. Set aside. 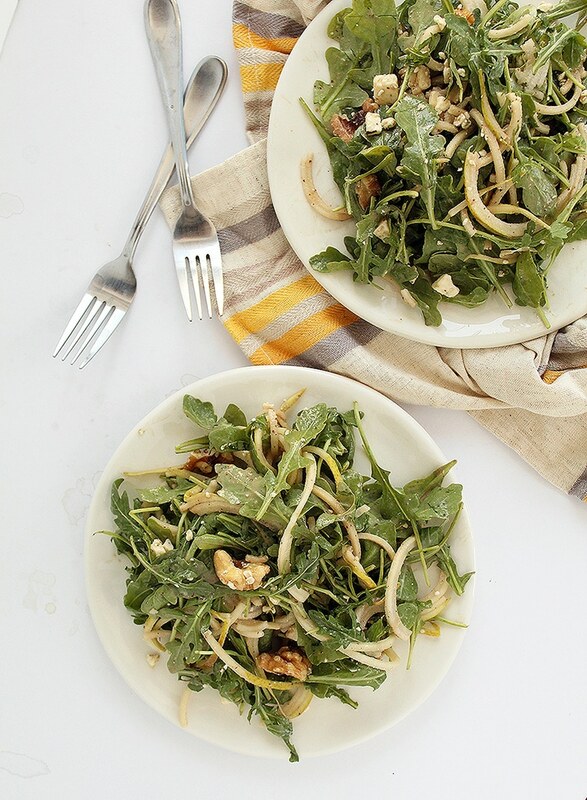 In bowl, combine pear noodles, arugula, walnuts and blue cheese. Toss to combine thoroughly. Serve salad drizzled with Greek yogurt dressing. 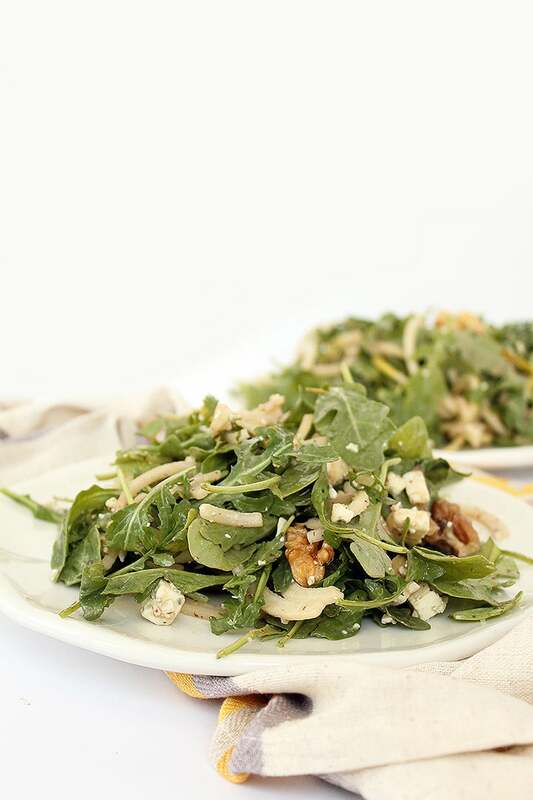 Pear and arugula salad with Gorgonzola is a favorite at our house. We add a few dried cranberries or pomegranate arils and some chopped, toasted hazelnuts for crunch. This is a great first course for a dinner party. I totally agree with your comment about all the "good stuff" falling to the bottom of salads! Currently experiencing this with my kale salad at lunch. Great post---love your blog! I love to put recipes in the Paprika app on my Ipad. With the new issuu app that is not possible?! Love to keep recipes to try later in Paprika it is so easy and I have a lot of your recipes stored there. When the recipe is actually in the blog that is possible today with the pear salad can not do it! How do you recommend packing lunches with spiralized fruits and veggies? salads are ideal for lunch but will the pear turn? I think that you should always have a printable copy of your recipes available if you are going to post it to your blog. This is the 2nd time that we are unable to print a recipe that you blogged about. This recipe was built for the magazine, so I don't technically "own" the recipe, but I did make it so I wanted to share it with my readers. Would you rather me not have shared it? I'm interested in your feedback! I am a TERRIBLE typist and it took me all of 3 minutes to type it into a word document. Some people are just never happy. Thank you for sharing your FREE recipes. :) Thank you, Ronni - you made my day! I just returned home from almost a month long trip to England. I have been catching up on the posted recipe emails. I usually print out the posted recipes and put them in a binder. I have been using the "print recipe" bar/link. The recipes have been recipe title and recipe...usually one page. Today, photos are being included with recipe with a huge amount of white space between recipe title, photo and recipe ingredients. In other words, I have a page with recipe title, a second page photo, and a third page of recipe ingredients. I'm not sure what is going on. I can't figure how to get the recipe title, photo and recipe ingredients to flow together without all the white space in between each. Is this solveable? Love your recipes. Love your blog-very minor inconveniences considering you are sharing fabulous free content with us. Very generous! I am a health coach (near your old stomping grounds in Basking Ridge) and I am starting a 6 week program and gifting all of my clients a copy of your new cookbook. Keep up the tremendous work! Hi! Just wanted to let you know that the magazine link isn't working. When I try to google it, I'm getting other recipes. Love your blog!